I’ve shared a lot of different lunchbox ideas here on the blog. I’ve shared healthy lunchbox ideas and ideas for things to pack in a thermos and occasionally I share some fun lunch box ideas like this Plants vs. Zombies sunflower, Angry Bird pig, or this lego inspired lunch. I don’t normally spend a lot of time shaping my kids’ lunches into characters because I just don’t have time for that, but on a special day it’s fun to surprise them with something fun. That is why I like adding little notes or jokes to my kids’ lunches! It’s a fun way to let them know I’m thinking of them, but it doesn’t take a lot of time. 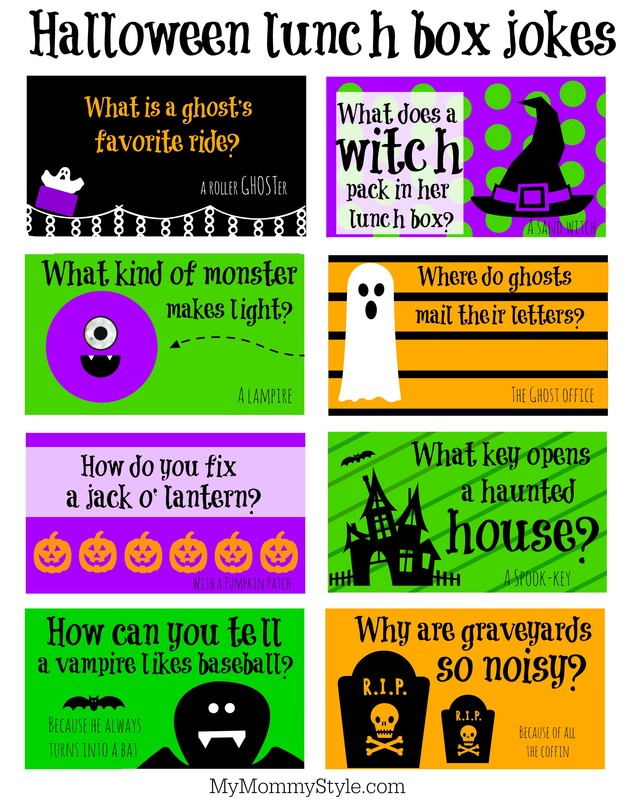 My boys love jokes and riddles right now so I thought some Halloween jokes would be perfect for this time of year. Click here for the free printable. All you have to do is print those jokes out and slip them in the lunchbox with whatever lunch you make for your kids that day. This lunch was so easy! I made a peanut butter sandwich, carrots, plum and a strawberry Chobani Kids greek yogurt pouch. I just slipped a joke right on top of everything once it was loaded into the lunchbox. If you’re looking for more fun jokes to share with your kids during the rest of the year, check out these great joke books.